"Le meilleur moment pour planter un arbre c'était il y a 20 ans. Le deuxième meilleur moment c'est maintenant." The assessment is the very first step in the development of a programme or project. The long-term goal of every assessment process is it to empower and enable people to analyze and tackle their problems themselves. In the shorter term the assessment process is used to map local priorities and improve the understandings of development issues. A good development process begins with respect and value for people’s existing knowledge and experience. Participatory Learning and Action (PLA) tools are providing an excellent entry point to facilitate a mutual learning process and to create space for communities to come together and discover their own wealth of knowledge and capacity for problem identification and problem solving. PLA tools offer the opportunity to go beyond mere consultation and promote indigenous knowledge sharing for sustainable development. In the section below I attempt to pull together lessons learned and field experiences from participatory assessments conducted in Vietnam and Laos. 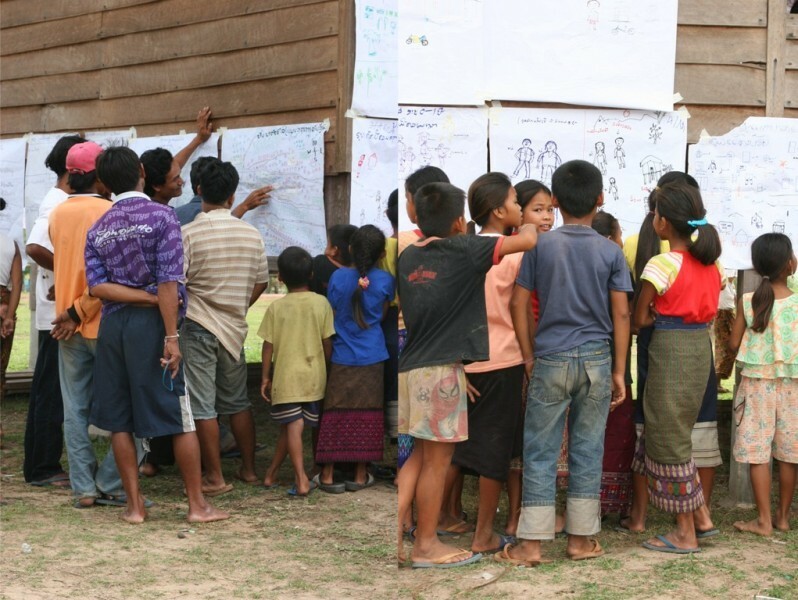 People most systematically excluded in many participatory planning exercises are those who are illiterate or do not speak the dominant national language, such as indigenous and ethnic minority people. Assessment tools dominated by written words, pen and paper tend to be monopolized by a few literate and articulate individuals. Further, there is a possibility that with these kinds of tools the assessment process becomes facilitator-driven, especially in areas where literacy levels are low. If visual techniques are used for data gathering, analyzing and presenting information (e.g. maps, calendars, timelines, diagrams, etc.) marginalized groups can be reached regardless of whether they speak another language, are illiterate or low-literate. By employing visualization everyone is given the opportunity to easily follow a discussion, even those who joined the discussion later. Thus, visualization helps to enhance communication between the oral culture of local communities and the literate society of development workers. In any community consultation process it is important to create conditions that will allow the greatest diversity of people and groups to participate and to carefully consider how potential barriers to participation will be addressed. A good practice for making sure that all the voices and especially smaller voices of children are heard is to organize separate meetings at convenient times and locations for women, men, girls and boys. Differentiating participation processes by grouping people by, for example interests, origin, age and gender helps to build confidence of individuals to first share views with people with the same kind of interest and to later confront others, argue their case and negotiate a consensus. Running sub-sessions prevents that ideas and views get lost that are perceived to be inferior. It permits people with common interests, concerns and priorities to explore them with greater enthusiasm and confidence in a trusting atmosphere. Thereby, the formation of sub-groups improves participation. In every Participatory Learning and Action process it is essential to make sure that the contributions of all people are properly recorded and documented. Such records are very valuable at a later stage of the project to monitoring impact and change. To facilitate documentation it is advisable to prepare detailed documentation sheets for different tools in advance to make sure that all important information and relevant observation is recorded while implementing PLA tools. Photos can be used to transfer PLA tools into paper format. A structural analysis is needed to ensure that issues are not dealt with at a superficial level and assessment results are seen as credible. Only through systematic analysis effective strategic actions can be determined. One possible analytical framework (or tool) for data analysis is the Sustainable Livelihoods Approach. The Sustainable Livelihoods Approach helps improving understanding of the livelihoods of the poor by organizing the factors that constrain or enhance livelihood opportunities, and showing how they relate. It can help to plan development activities and to think about the objectives, scope, and priorities of a potential development project. Although Participatory Learning and Action processes strive to involve communities in all stages of the research process, in reality, time constraints and other barriers frequently result in little or no involvement of communities in data analysis. A suitable tool to expand community involvement in analyzing data and interpreting findings are gallery walks. In a gallery walk all the results developed during the assessment process are hang up on a wall (e.g. in the village office) and participants divided into groups of 5-8 people to move from poster to poster and record main findings (e.g. possible development objectives, activities) from each poster. Once all the posters have been reviewed, a representative from each group will be asked to presents their objectives findings to all participants. An assessment process should neither be a pre-planned blueprint nor an undefined ongoing process. 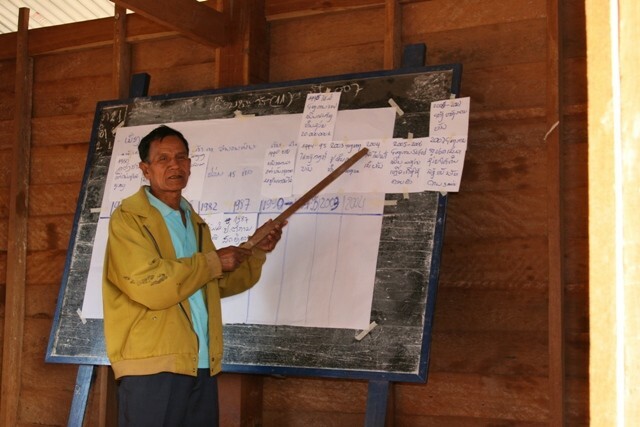 Ideally assessment teams should be trained on a range of PLA tools and techniques which can used to stimulate thinking about the situation in target villages and encourage strong participation of diverse groups. While keeping work plans flexible, it is important to provide guidance about how PLA methods can arranged in a systematic way to provide a structure for community members and facilitators to analyze vulnerabilities, assets, livelihoods, coping strategies and development priorities. Users should be trained on how to combine tools in way to allow facilitators to validate information through triangulation and encouraged to modify the selection and application of methods and tools as circumstances dictate. Participatory methods are only as good as the people who facilitate and use them! Facilitators have a key role in creating an environment in which individuals can empower themselves to address their own development needs. The Village Resource Map is a good tool to begin with. It is easy and fun for the villagers to do and suitable for the community to show and talk about how they see the area where they live, the resources available and what is important to them in their environment. 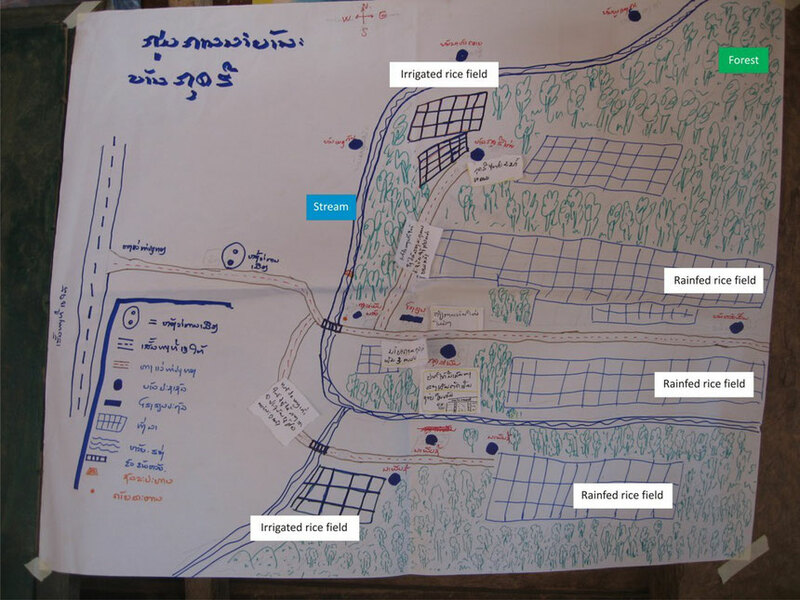 Village Resource Maps can be used to analyze problems in the use of natural resources and identify options for sustainable natural resource management. 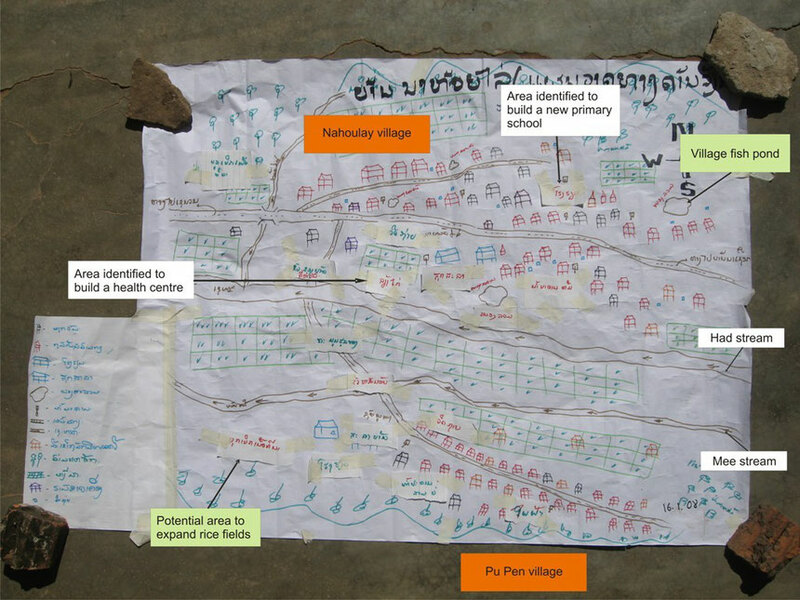 Village Social Maps help to learn about the social structures and institutions found in an area. They also help to learn about social and economic differences between the households. Houses shown in the upper part of the map belong to Nahoulay village, houses in the lower part of the map belong to Bu Pen village. The majority of the rice fields belonging to Nahoulay village lie on an island in-between two rivers separating both villages. The larger stream is called Had stream, the smaller one Mee stream. Both rivers flood during rainy season, so that it is very difficult to get on the island to take care of the rice fields. Since there is no stable bridge, farmers tried to build a simple suspension bridge with locally available materials some time ago. Due to heavy rains, the bridge was destroyed. Two areas were identified to expand paddy rice land. One area lies to the west of Nahoulay village, another area in the western part of Bu Pen village. The map shows two different types of forest: production forests (mainly secondary forest) and protected forests. It also includes a couple of fish ponds. Some of them - especially the larger ones - are community owned; the smaller ones are private fish ponds. Nahoulay village has one village office, one school and seven boreholes serving about 50 households. People in this village would like to have a new health station as well as a new primary school. Suitable construction sites are indicated on the map. There are only two boreholes for about 30 households in Bu Pen village. Villagers mentioned that they would need at least 3 additional boreholes. 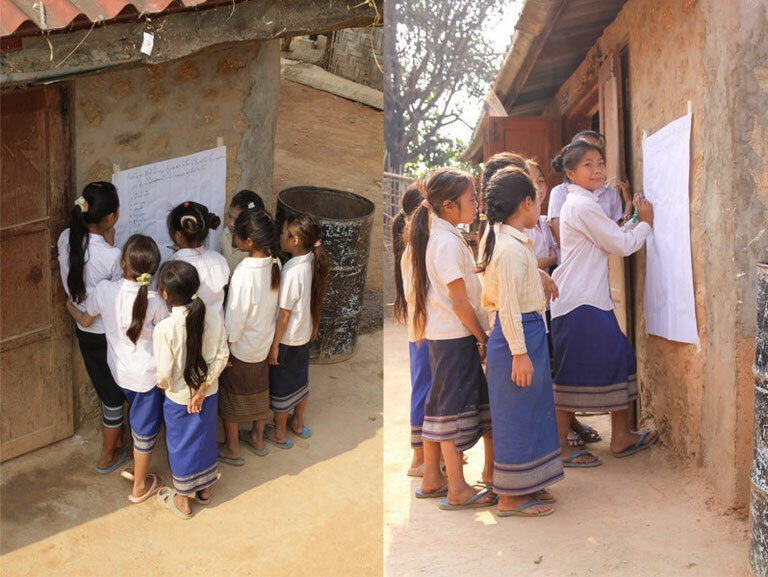 Many households in Nahoulay village received support from a previous development project to build latrines. Almost 1/3 of the households in Nahoulay village had an own family latrine when the assessment was conducted. 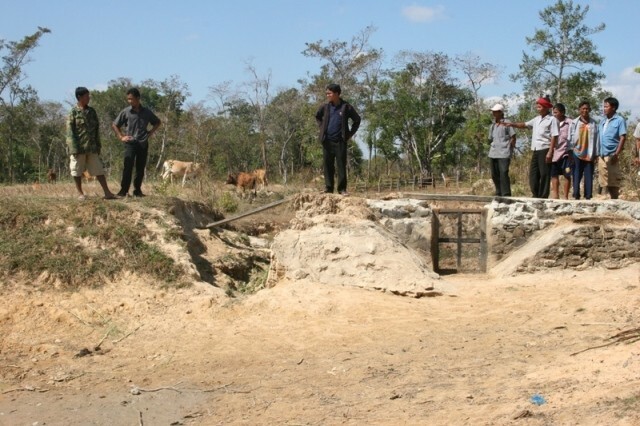 Villagers in Bu Pen village have not a single latrine so far! The nearby forest serves as a latrine. Three different colours were used to identify household poverty levels: Black houses - poorest households; red houses – households having enough to make a living. Orange houses - rich households. After a short break, the group of men had a look at their maps again to identify development potentials. Whatever participants mentioned was written on small pieces of paper directly stuck on maps. 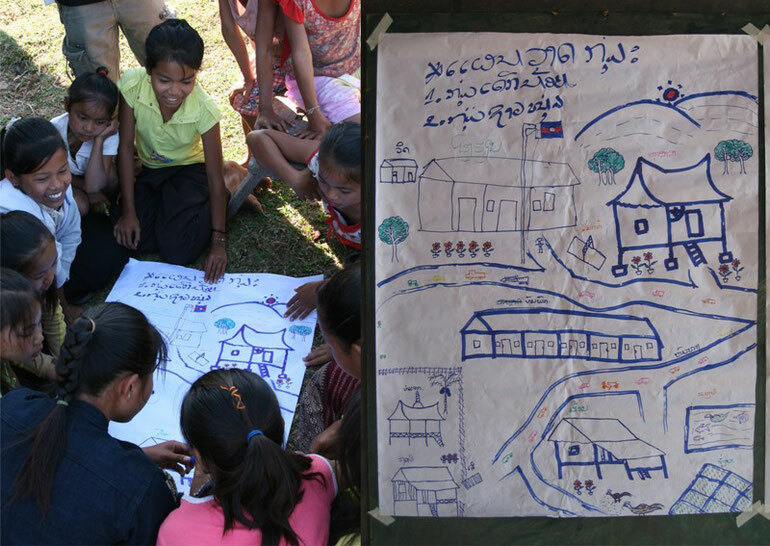 Village maps are particularly sensitive to the composition of the participating group. Outputs differ consistently if generated by women, men of children. When producing Social Maps, women tend to give more attention on health and social infrastructure distribution (e.g. places of worship, temples, shops, etc.). 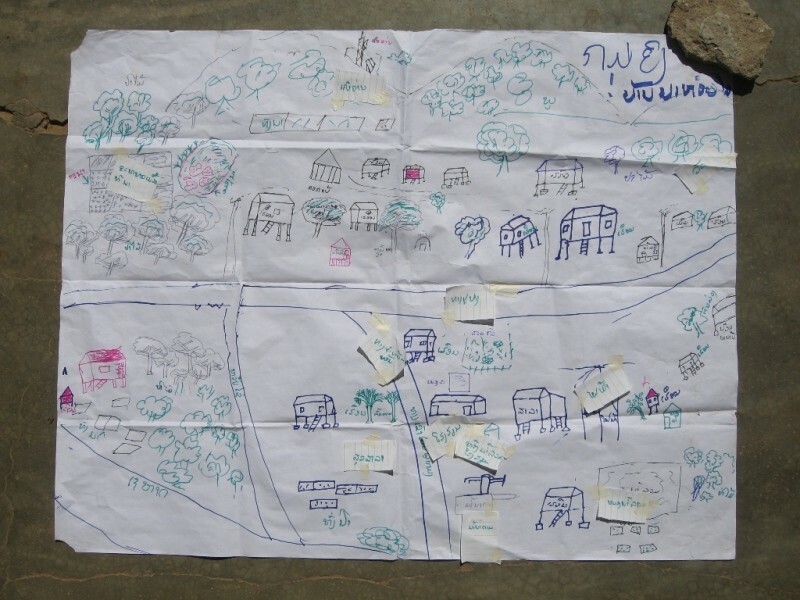 When developing Village Resource Maps, women will map the resources most important to them (e.g. water sources, firewood sources, etc. ), while men will map the resources they think are important (e.g. grazing land, production forest, etc.). 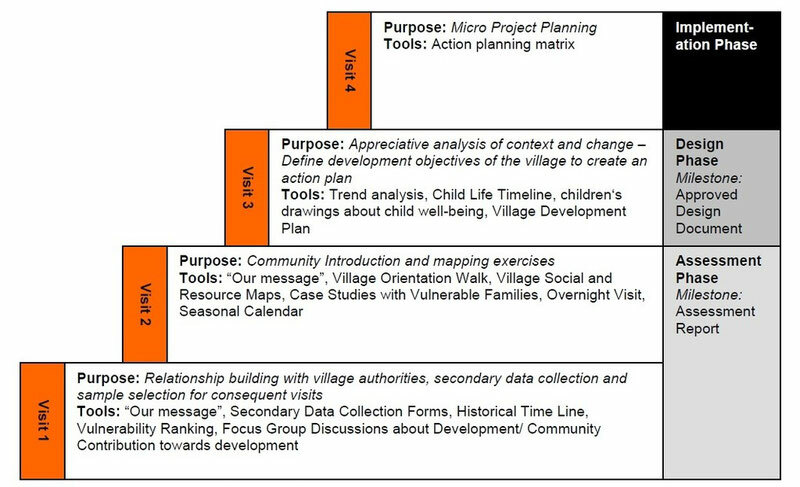 Like village maps historical timelines are suitable to be employed in the initial stage of a Participatory Learning and Action process as a sort of icebreaker. Especially older participants can become quite enthusiastic in narrating the history of their village. 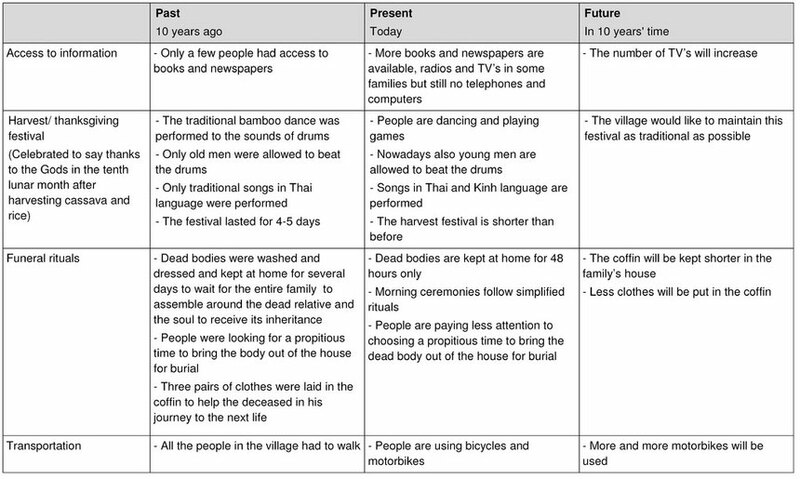 The timeline thus takes the outsiders closer to the community and helps to gain trust and support from village elders. To provide an overview of key vulnerabilities (e.g. disasters, human diseases, animal and crop diseases). Even the remotest village is witnessing tremendous changes. They are observed everywhere and in every field. There are changes in cultivation and livelihoods systems, education and health services, lifestyle, culture, etc. The trend analysis tool helps to analyze the trends and changes in the life of individuals, households, and communities. Based on the past trend, future trends can be also forecasted, by facilitating the people to peep into the future. A transect walk is a systematic walk along a defined path (transect) across the community/ project area together with local people to explore the topography, crops grown, animals kept, income generation activities, village infrastructure, development potentials and constraints. In a transect walk it is best to walk a route, which will cover the greatest diversity in terms of resources, environmental features, activities and people. During the walk, participants discuss everything encountered or noticed which could be of relevance. The assessment team members facilitate these exchanges by asking questions and making observations. They also record the discussions/take notes. The information collected during the walk is used to draw a diagram or map based on discussions held amongst the participants. Moreover, walks of these kinds help to verify the information provided by other tools, both through direct observation and in discussions with people met along the way. identifying opportunities and limitations for sustainable land use, for increasing agricultural production or for alternative non-farm income activities. Photovoice is an innovative community engagement tool which provides cameras to local people to enable them to document and communicate their environment, culture and change in their own communities. It uses visual images and accompanying stories to promote an effective participatory means of sharing expertise and indigenous knowledge. The availability of affordable digital cameras revolutionized the applicability of photovoice, which was previously dependent on the availability of a local photographic shop to develop films from disposable one-way cameras. 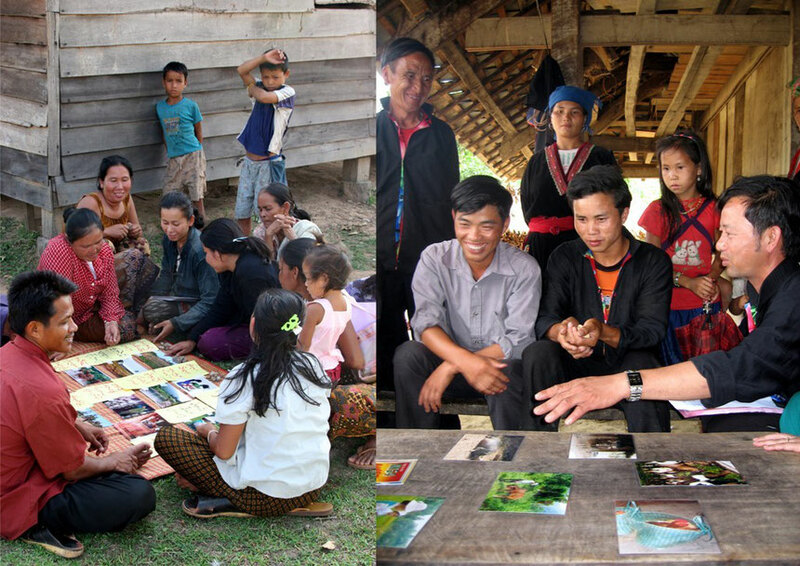 Thanks to digital cameras, portable computers and printers, photos taken with the photovoice technique can be immediately interpreted and discussed, even at the village level. Photovoice proved to be an excellent tool to mobilize and empower boys and girls during the assessment process to discuss what they think is really important in their village and life, as well as to articulate their daily experiences and future visions. that are giving them a sense of worth and meaning. 7. Develop or print out photos for participants.